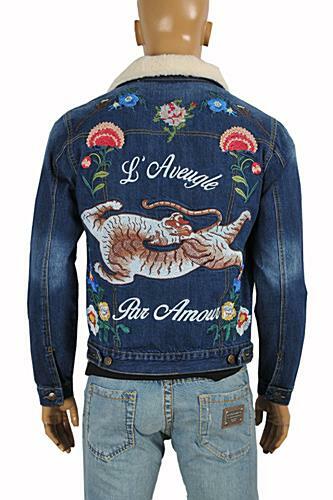 This jeans GUCCI bomber jacket presents the roaring tiger as an embroidered appliqué flanked by the printed phrase "L’Aveugle Par Amour." Translating to “Blind For Love” it encompasses the idea that love blinds you-a concept that speaks to Gucci's romantic vision and inspirations. This Jacket is made in Italy of 100% cotton in blue color. Length (from neck seam to the bottom) 24" 24" 24½" 25" 25½"